What is the history behind MegaTokyo? Back in 2000, Rodney Caston, known online as Largo, convinced Fred Gallagher, known online as Piro, to start a webcomic with him. They started off with two strips that they posted in May to Rodney’s website. When a link from Penny Arcade sent some viewers their way, they decided to continue on, and relaunched the site in August with a three per week update schedule. As time went by, characters were added and storylines developed. In May of 2001, the existing strips were declared “Chapter 0” and the storylines started moving forward. Due to creative differences with Fred, Rodney’s input into the comic waned and the partnership was officially dissolved in June 2002. MegaTokyo entered the print world with the release of the first book in January 2003 by Studio IronCat, it later changed publishers to Dark Horse Comics in August 2003 and then again to CMX (an imprint of DC Comics) in February 2006. By 2010, Fred had published 6 books of MegaTokyo comics. The comic won a number of awards and proved very popular. MegaTokyo merchandise moved from CaféPress to ThinkGeek in late 2002, then Fred and his wife Sarah opened Megagear in July 2004 in order to sell their merchandise themselves. In the fall of 2008, MegaGear acquired a direct-to-garment printer that allowed Fred to begin on-demand tshirt printing with high quality color images. A dyesub printer was added to print MegaTokyo mugs and other swag. Starting around 2008, life things starting happening to Fred and family. Fred and Sarah had a son; Sarah then spent several years fighting and beating a rare form of lymphoma, on top of her existing auto-immune issue; Fred had serious heart problems that required surgery; Sarah's mom's health declined and she passed away; Fred's dad developed a bad case of Parkinson's; Fred's mom had a series of health problems and then increasingly serious dementia; and on and on. Comic production slipped for years while Fred concentrated on taking care of family, and without regular comics many fans drifted away. After a very successful Kickstarter in 2013, Fred and team started development on a MegaTokyo Visual Novel game. It did not go well. Inexperience with game development; Fred learning to delegate and work with a team; major feature creep; a big underestimation of the quantity of artwork required; the realization that only Fred could draw stuff that looked "MegaTokyo"; and lots more. By the time some of these issues had improved, the MegaTokyo comic had been neglected for too long and Fred couldn't afford to work on the game full-time anymore. Fred and team are still working on the game, but it is coming slowly and only part-time. Fred's tshirt printer and dyesub for the Megagear store both broke, and he couldn't justify the cost to repair or replace them. In 2014 and 2016, Dark Horse Comics reissued Books 1-6 as a pair of MegaTokyo Omnibus editions, but sales had slowed as Book 7 was delayed by the still slow new comic production. Fred turned increasingly to the sale of non-comic illustrations in the Megagear store to support MegaTokyo, which in turn left even less time for comic production. It was a vicious cycle. In 2017 Fred started a Patreon site so fans could help support MegaTokyo comic production directly. That support is helping Fred get back to putting out comics more frequently again. And in 2018 Fred made Megatokyo t-shirts available again through Teespring. Fred still divides his time between comic production, the visual novel, illustrations, and Life™, but the future of the MegaTokyo comic is starting to look brighter again. Where did Fred go to art school? He didn't. He's actually an architect and worked as one until October 2002. His ability to draw came from lots of observation and practice on his own, but you can see the architecture experience in the buildings and rooms he draws in the backgrounds. Due to creative differences with Fred, Rodney’s input into the comic waned and the partnership was officially dissolved in June 2002. Since the start of the Patreon in 2017, Fred is back to 4 new comics per month, but there is no set schedule. Where can I find a translation when Japanese is used in the comic? Do a search in the Story Discussions section of the forum on the strip title, they usually have it covered. Kimiko's long japanese speech in comic 716 has a full translation to english in Book 4 and Omnibus 2. How is the comic made? The exact method has changed and evolved over the years as Fred experiments with new ways of producing the comic. Fred originally drew in pencil on bright white inkjet paper. The comic began in a four panel format, it switched to a full page format in April 2001. For this, Fred would draw one or two panels per sheet of 8 1/2 × 11 inch paper, then scan them in and assemble them in Adobe Illustrator. In October 2006 he changed to drawing the entire comic together on one 11 × 17 sheet of paper. That lasted for a short while, and then he switched to working completely digitally with his Wacom Cintiq tablet. In 2013 he went back to pencil. He felt his art was stagnating some while drawing digitally and the switch back to pencil brought some freshness back. He currently draws the comic on HP Bright White InkJet paper, using a 0.4mm Pilot S5 pencil. He then scans the drawings, cleans them up on the Cintiq in Photoshop, and then assembles the comic in Illustrator. Fred does not ink his comic. He thinks his art loses something when he inks. Many other comic artists ink, and Fred is totally cool with that. He just thinks his art is better in pencil. In March 2009 he began Fredarting, a streaming live video feed of the comic being drawn. At various times it was on JustinTv, Ustream, and YouTube, but has now settled on Fred's Twitch channel. Fred does almost all of his comic and other work live on Twitch. The comic itself is black&white, but Fred will often color non-comic illustrations. When he wants to color, he will scan the pencil drawing and print it out on Epson Ultra Premium Photo paper using an Epson SureColor P600 printer using pingment ink, then color using Copic Sketch markers (he has all 5 of the 72pen sets) or occasionally with watercolors. The markers would smear the pencil, which is why he scans and prints first. What font is used in the comic? The general text uses a font called “comic book” from a now defunct font company. Why won’t Fred respond to my email? Fred receives a lot of email and can’t possibly respond to it all, but thank you for writing. If you have a chance to see Fred at Youmacon in Detroit, he will be happy to draw a small sketch for you. Fred rarely takes on commisions as he is too busy with his own work and is generally uncomfortable drawing characters other than his own. But if you want to ask, the best way is to send him an email. What’s your policy on fan art and fan fiction? Fan works are fine, we encourage our readers to be creative when MegaTokyo inspires them, as long as it's respectful toward the characters. We even have a Fan Works forum section just for these sorts of things. Can I use images from MT on my own site? Certainly, as long as they are labeled as coming from MegaTokyo. Is there ever going to be a MegaTokyo anime? We won’t rule out the possibility but it’s not something that Fred plans to actively pursue. Warmth is a story idea that Fred has been kicking around and occasionally working on since before MegaTokyo began. What is a dating sim game? The dating sim, also known as bishoujo game or ren’ai game, is a genre of video game in Japan typically involving a male main character and several girl character that the player can choose to romantically pursue. There are several subgenres with varying levels of interaction, ranging from games built around long passages of text interspersed with an occasional multiple choice question to games where level building is required to advance. They often, but not always, contain adult scenes. Many of them are adapted into anime series. What’s l33t? Did MegaTokyo invent it? L33t, from “elite”, is a method of writing by using numbers or combinations of typographical characters to replace letters, i.e. 4=A, 3=E, 7=T. It predates MegaTokyo, and is believed to have originated in the BBS culture of the 1980's. Help! I don’t know what’s going on! MegaTokyo is heavy on storyline and Fred loves layered meanings, jumping into the middle isn’t the best way to read it. All the comics are available for reading on the web. You can also ask questions in the Story Discussion part of the MegaTokyo forum. How much time has passed in the story? Piro and Largo have been in Japan for about two months. Chapter 0 spanned fifty-two days and each chapter after that through Chapter 9 is one successive day. Chapter 10 picks up again nine days later. Endgames is an MMORPG that exists in the MegaTokyo universe that Piro and Largo used to play. They were surprised to find that an adversary of theirs from the game lives in Tokyo. In addition to what is in the comic, Thomas Knapp has published 5 books and 1 short story about MegaTokyo Endgames. You can find them in print on Amazon, as well as for the Kindle, Nook, and Kobo e-readers. What are those Omake Theatre things like Grand Theft Colo? Omake means “extra.” Omake Theatre stories give Fred a chance to do different things with the MegaToyko characters. Will Piro and Largo ever get home? When are we going to get backstory on the characters? Back story is developed and shown in the comic when it is relevant to the current story arc. Why are some characters’ lines in brackets? That is to indicate when a character is speaking Japanese. Where are things located in MegaTokyo? Several locations have been mentioned in the comic. 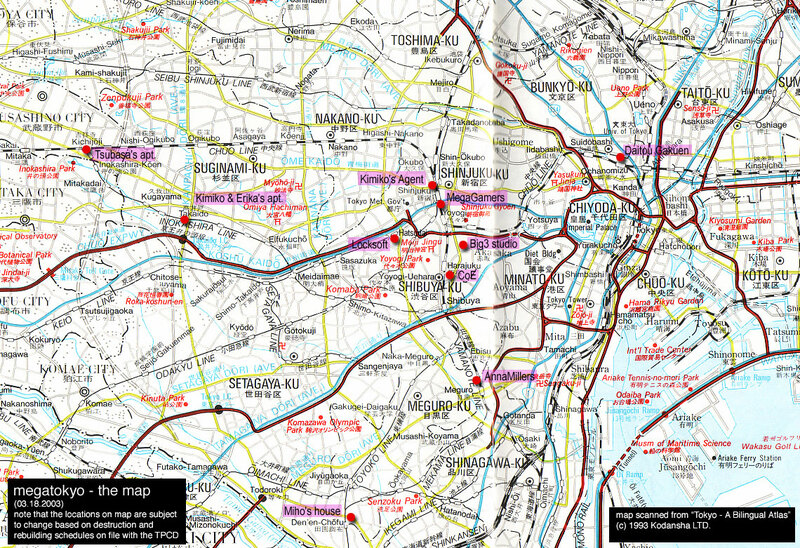 You can see the layout on this map of Tokyo, though that is an early draft from a while back and isn’t set in stone. What color are the characters’ hair? Piro is blonde, Largo has red hair, Ping’s hair started at its default grey but later on changed to pink, then blue, then dark. The Japanese characters tend to have darker hair, except Junpei who dyes his various colors. Colored versions of the characters can be seen in Dead Piro Day comics, the book covers, and the posters and prints sold by MegaGear. How do you pronounce Piro? Piro’s game characters. Piroko is for Quake and other shooter games, Pirogoeth is his Endgames character. Yes, he does prefer playing using female characters. Where did the names Piro and Largo come from? Piro is a pet cat in the dating sim game Kanon, it was named after a Russian meat-filled bun called a piroshki. Largo is a villian in the OAV series of Bubblegum Crisis. MegaTokyo is itself the name of the city in Bubblegum Crisis. They’re real to him. Other characters may be skeptical. Where is Largo’s cool thing? It’s around the apartment somewhere. We’ll see it again when Largo has need of it. What does the cool thing do? If we figure it out we’ll let you know. It’s representative of all gizmos and gadgets that people buy more because they are cool than because they actually need one. Where did the idea for Ping come from? Ping is an amalgamation of robot girls archetypes from anime and dating sim games. Some main inspirational sources are All Purpose Cultural Cat Girl Nuku Nuku, Multi from To Heart, and Mari from Boku no Mari. Fred didn’t see Chobits until after Ping was developed. I can’t stand the suspense! What is the truth behind Miho? She won’t let us tell you. But a lot more has been revealed in chapters 11 and 12. Is this Boo, like, THE Boo from Baldur’s Gate?? Yep, that’s him. Rodney was a big fan of Bioware’s games. Which characters are based off of real people? Why was Tsubasa gone for so long? The real life Tsubasa asked for his character to not be involved in the comic anymore. When is my favorite character going to be in the strip again? There are a lot of people that are important to MegaTokyo, no doubt they’ll all show up again eventually. What about tshirts and other swag? Fred used to sell t-shirts and other swag through the Megagear store, but his t-shirt printer and dye-sub are both broken and he can't justify the cost to fix or replace. So those items are not currently available. Fred does plan to make t-shirts available again through Teespring or some other third party, but he has not yet had time to set that up. We will announce when those are available again. Book 7 will come out after Fred has finished the comics for chapter 12. As of early 2019, Fred was just a few comics away from being done. Hopefully someone will want to publish it, and it might be out sometime in 2020. Fred no longer stocks books in the Megagear store. He will occasionally sell limited quantities of books, signed and with a sketch, but you will have to catch it when it happens. You can find MegaTokyo books in the manga section of most book retailers, as well as online at places like Amazon, Barnes&Noble, BookDepository, and more. What are some other MegaTokyo related sites?